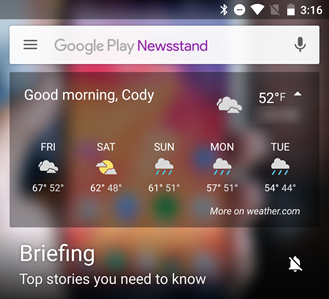 Play Newsstand has been quietly going without an update for much longer than normal, and now we can see why. 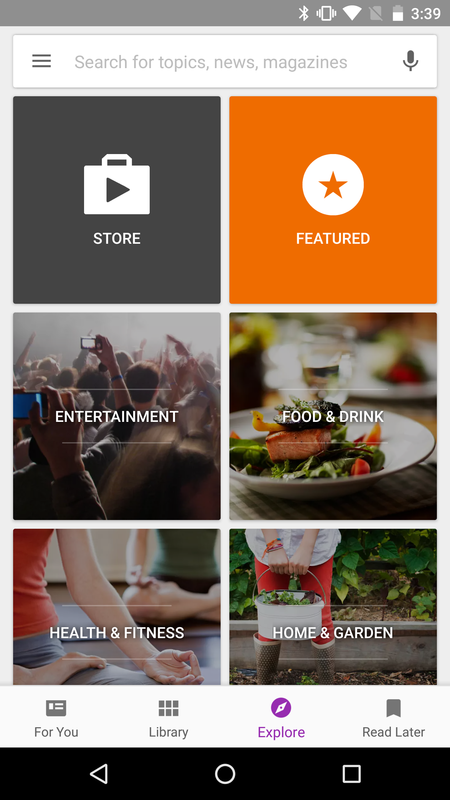 Version 4.0 began rolling out yesterday and it's packed with a whole new look and a few new features. 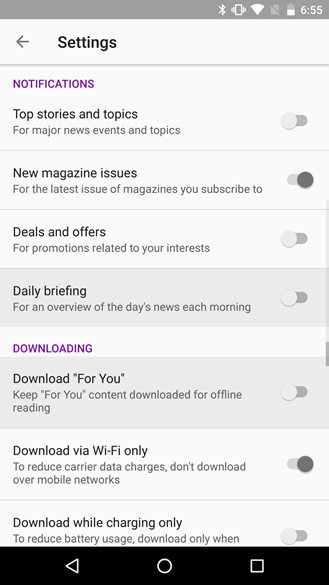 If recent events haven't scared you away from reading news, there's a link at the bottom of this post where you can grab the latest update from APK Mirror and skip ahead of the regular rollout schedule. 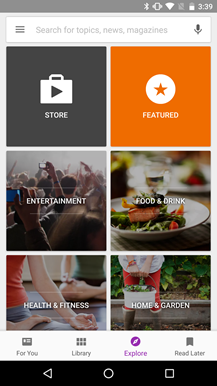 Open up Newsstand v4.0 and you'll immediately see things have changed. Gone are the Highlights and Top News streams with a series of individual subject columns stacked to the right. This place is now occupied by a friendly personalized greeting accompanied by the current weather, and the screen leads on to a single stream of stories under the title "Briefing." This is now the focal point of Newsstand. The current top five stories are lined up here, followed by highlights from various subjects. A search bar sits at the very top of the screen, but auto-hides with scrolling. Just below it, the little weather widget can be expanded into a basic 5-day forecast with a tap. 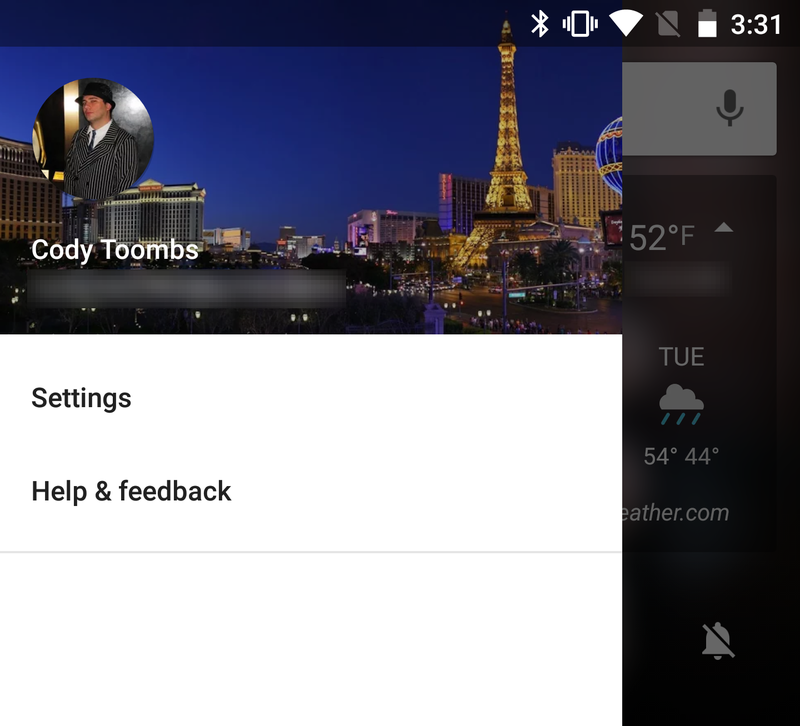 Most of the nav drawer has been scooped out to create a bottom navigation bar, leaving the drawer pretty empty, save for links to Settings and Help. 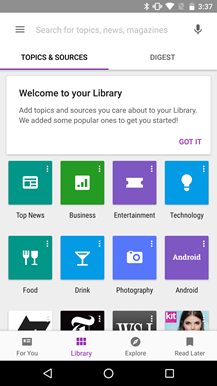 The four screens you can go to are titled For You, Library, Explore, and Read Later. 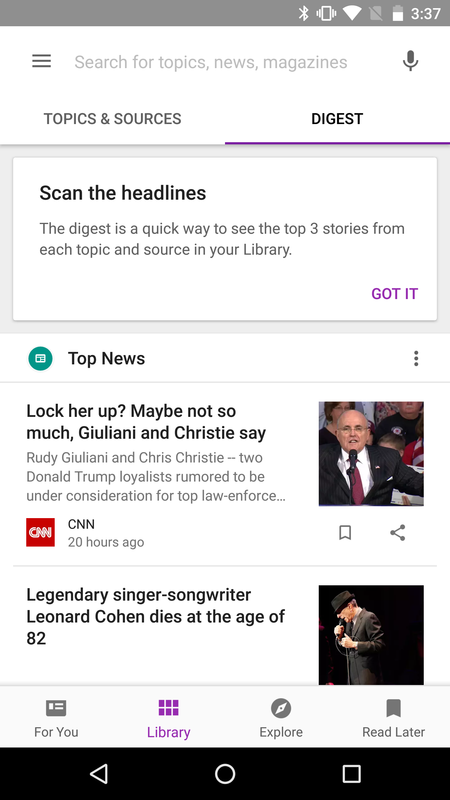 The latter two are no different than the Explore and Bookmark screens from the previous version. 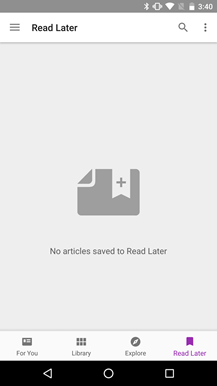 In fact, the bookmark functionality was already storing articles for offline use, so it already worked in the way you would expect for Read Later. 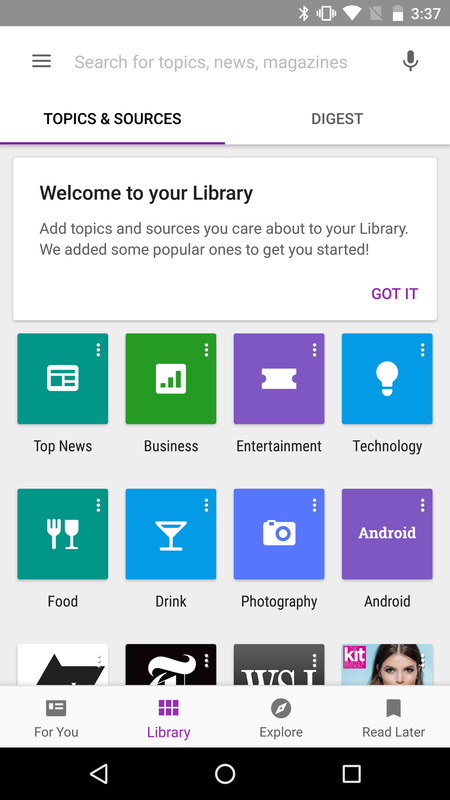 The Library screen is a partial reorganization of the My Library screen from earlier versions, but it merges most of the functionality into a tab titled Topics & Sources. 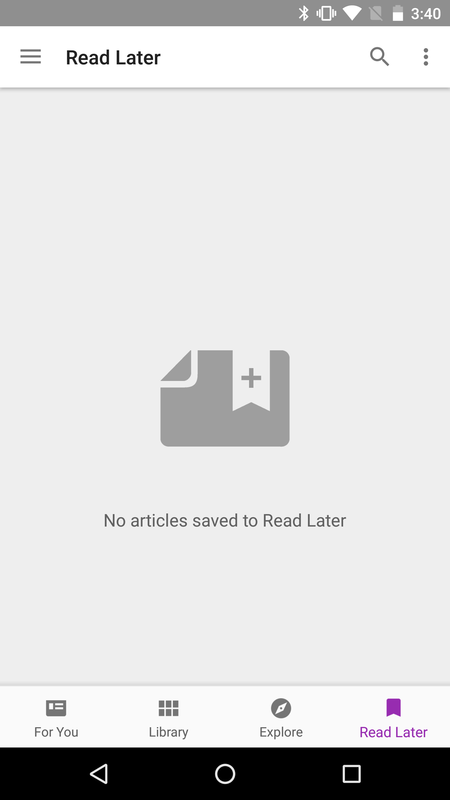 If you're wondering what happened to your magazines, they're still there, but they've been buried at the bottom of this tab. This seems to suggest Newsstand is harvesting articles directly from recent issues to place in your feed. 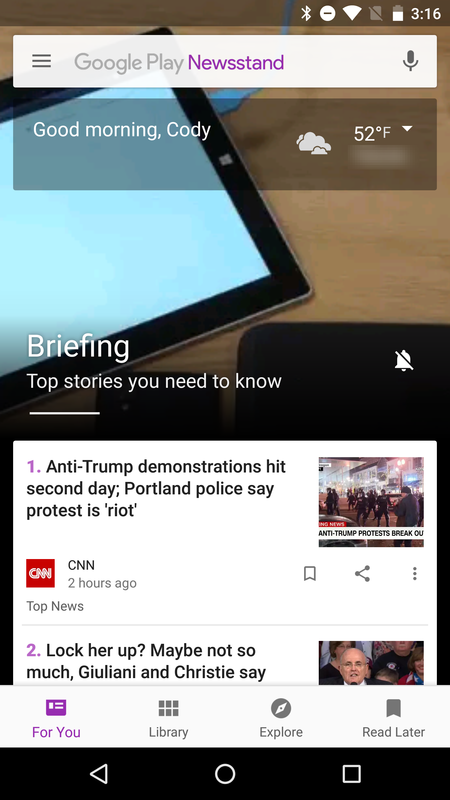 The second tab on this page is called Digest and it's sole purpose is to aggregate the top three stories from each topic and source. 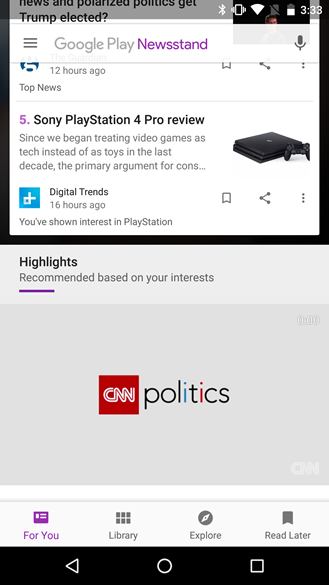 Left: Digest tab. Right: search bar suggestions. 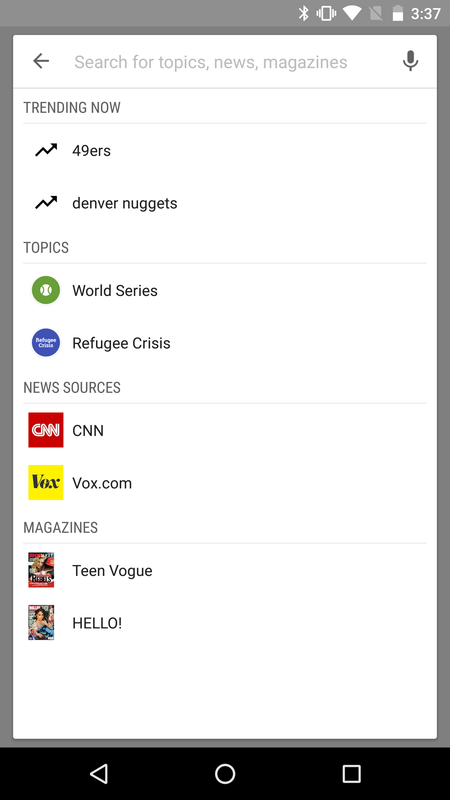 Tapping on the search bar will now open a screen with suggestions for possible searches and landing pages including trending subjects, topics, news sources, and magazines. 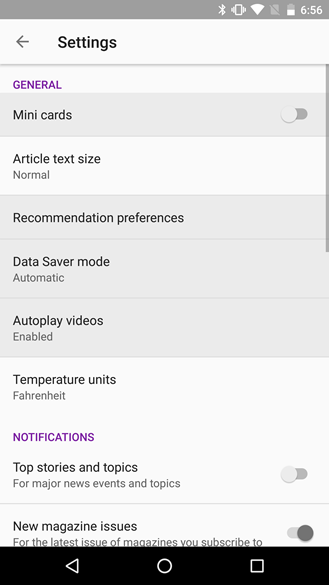 And finally, there are several new settings to control various behaviors. 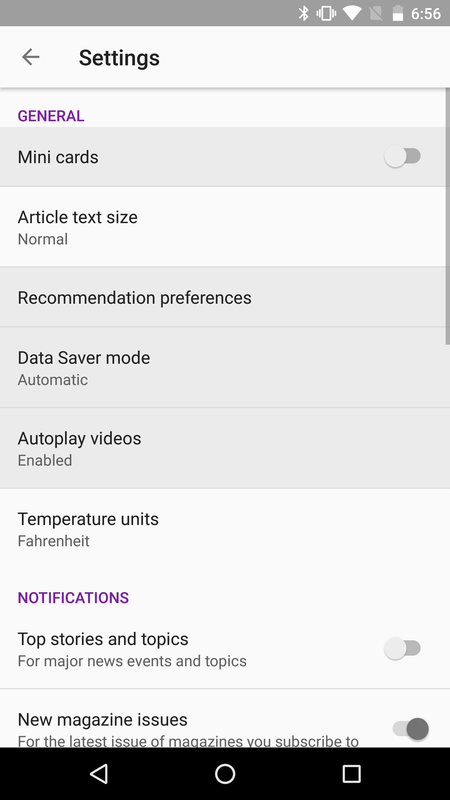 The additions include a toggle to turn on Mini Cards (this used to be in the overflow menus), a screen to manage recommendation preferences, a setting for Data Saver mode (On / Off / Auto), and options to autoplay videos (Enabled / Wi-Fi only / Disabled). 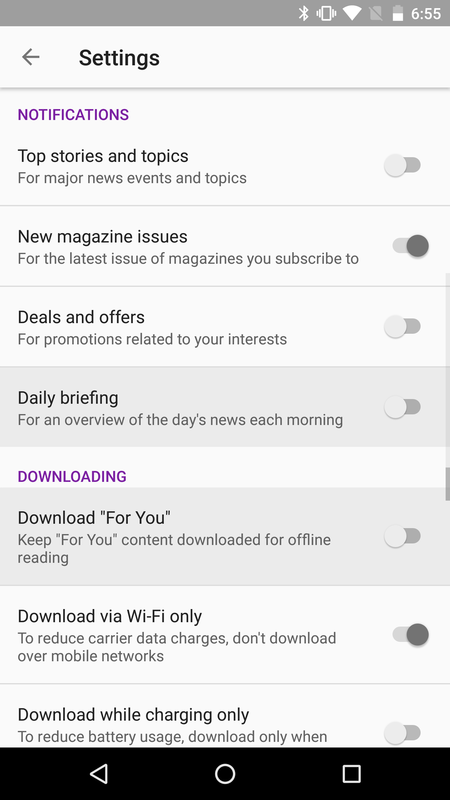 Looking further down on the list, you'll also find toggles to turn on notifications for the Daily briefing and to automatically keep content from the "For You" page (a.k.a. Briefing) stored for offline reading. Most of the functionality remains basically the same, but a lot of things have been moved and a lot of attention has been put on the Briefing page. I feel like this makes it a little harder to open up certain types of topics or control the feed quite as well, and the initial Play Store reviews seem to agree, but this is still a new change and it's likely this interface will be ironed out in time..
Update 11/16/16: Google has put up the official redesign post here.